I have many times heard wakeskaters discussing about what skateboarders think of wakeskating and how likely it is that any of them would want to do it. Andrew was just that: a skateboarder kid in the Midwest who fell in love with wakeskating and has followed it ever since. And if you have witnessed his riding firsthand you likely walked away with a story about some insane switch flip trick line or locked in rail trick that was done with complete ease and perfection. Andrew’s riding could very well start a new standard in wakeskating as far as how clean a trick is done. I have never seen anyone stomp the hell out of their tricks the way Andrew does. He is a fearless wincher and has a funny habit of doing a trick two or three more times after he lands it, just to get it as perfect as possible. For further proof, just check the scoreboard at any of the recent Toe Jam competitions, where Andrew placed in the top two or three in most of the events he attended. On top of it all, Andrew is one of the friendliest dudes you could ever hope to meet, and is too humble to even talk about himself much during this interview. 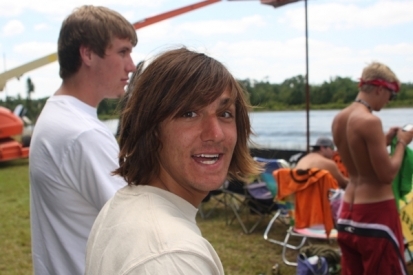 Andrew is basically the wakeskate dream come to life, and a good promise for the future. Everyone is happy to see it. 1) Question number one Andrew, this is from Keith Lant…Do you like to party? 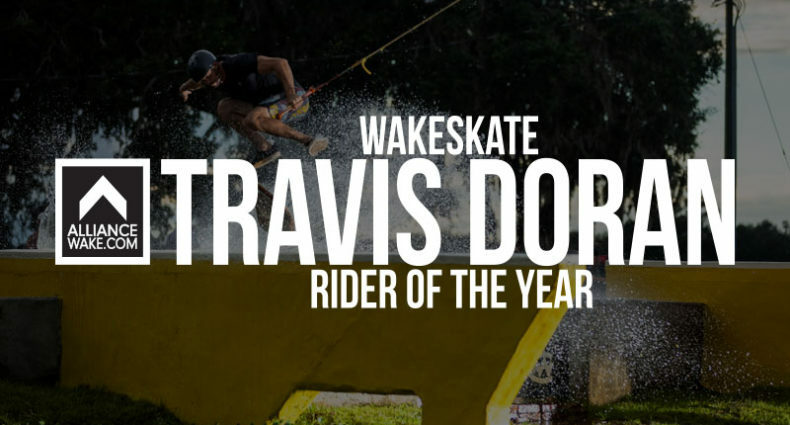 2) Just to get things straight, do you do anything besides wakeskate? 4) You just moved back down to Orlando after spending the summer back home. How was your time at home and how does it feel coming back to the Dirty O? It was really fun back home, I got to ride with Austin a lot. It was definitely a good change of environment over the summer to get to go home and hang with the family and friends and stuff. What was the other part? 5) How does it feel coming back? Coming back here is always fun. Nice weather to come down to, rather than it freezing up north. 6) Tell me what you’ve learned about life with a mustache. You can definitely buy beer underage. 7) I think people want to know how you started riding in Ohio and got so good, go ahead and speak of it. Well I started off wakeboarding with my cousin a couple times; he was way into the whole wakeboarding thing, so he kind of pushed me to get into it. He knew I skateboarded so he eventually bought a wakeskate and took me out and let me try it out. Kind of been hooked ever since. 9) Who did you see wakeskate to find out what was even possible? I went out and tried it, and then I think my cousin bought Sfumato, and I watched that. That was pretty cool seeing those guys do all that stuff. So I got to see what was possible and what was happening at that time, and then I just started riding with my little brother and my cousin and met a few buddies, my buddy Troy and some other guys, been riding with those guys up in Ohio. Bunch of cool dudes that shred. 10) What’s it gonna take to get the scene in Ohio happening? It already kind of started happening this last summer, me and my brothers Austin and Aaron have gotten a couple of buddies that skateboard out on the water. My buddy Graham, he shreds on a skateboard, he’s just been starting. We’ve gotten all kinds of kids to get up and stuff, they just have to stick with it. 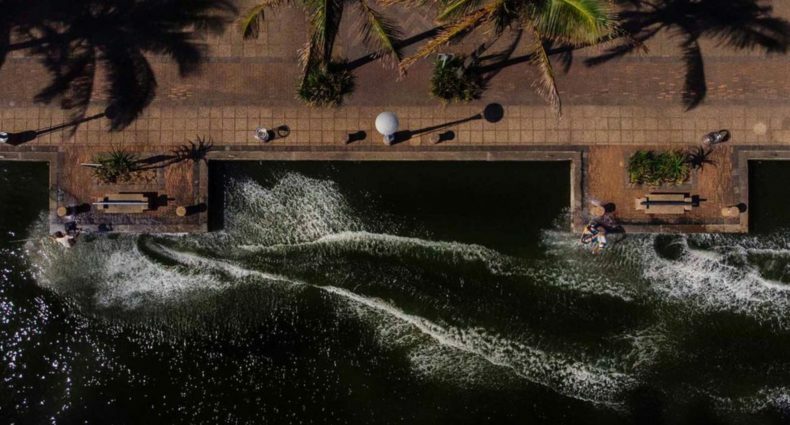 11) Do you think it’s unhealthy how much wakeskating is centered in Florida and in Orlando or do you think that’s just how it’s beginning and how it’s starting out? Do you think it would be better for people to try to start their own thing rather than just moving here? It would definitely help if people hung around their area and started a scene up I guess you could say, but you can’t always do it when you live up north. It’s really cold. 12) Your brothers. Where are they? They’re up in Ohio, hanging out right now. 13) Are they jealous that you’re down here in the warm weather? Yeah. Eventually hopefully we can get Austin homeschooled and make him move down here for high school. 14) And we can homeschool him? 15) Is Austin going more for the “grown up little kid” or “sponsored little kid” look? Definitely grown up, I don’t think he has any friends his age. He always hangs out with me and Aaron’s friends. He’s definitely an 18 year old in a 13 year old’s body. 16) Who or what do you see yourself getting most of your style and riding ideas from? Skateboarding…Thomas Horrell… I don’t know, I don’t like really calling out people’s names. Just basically watching skateboarding and using that as reference. 17) What is the ideal photography/filming setup for you? 18) Bam Margera. Your thoughts. 19) Hand plants. Your thoughts. Um…hand plants? What on a skateboard? 20) Yeah, or just in general. Hand plants? Hand plants. That’s all I have to say about hand plants. 21) How long do you see yourself staying in Orlando? ‘Til it gets warm in Ohio. 22) Why is switch riding so important to you? It’s not that it’s important, I just like doing it just because… I don’t know. It’s fun. 23) Why does everyone call you the champ? Explain. 24) Do you think we enjoy seeing you irate? I usually don’t get irate, but sometimes I do…so maybe? I don’t know. 25) You are known for being a perfectionist with your tricks. What’s your theory behind the way a trick is done? I get really aggravated if I do something that’s not right and it doesn’t look good. 26) Why do pro wakeboarders hate you so much? 28) What are your thoughts on Criss Angel? I don’t know too much about the guy, but from what Jimmy Chadsey says, he’s a pretty cool guy. 29) Why is your little brother so damn good? I don’t know, ‘cause he’s really good at skateboarding and he’s just all around good at life. 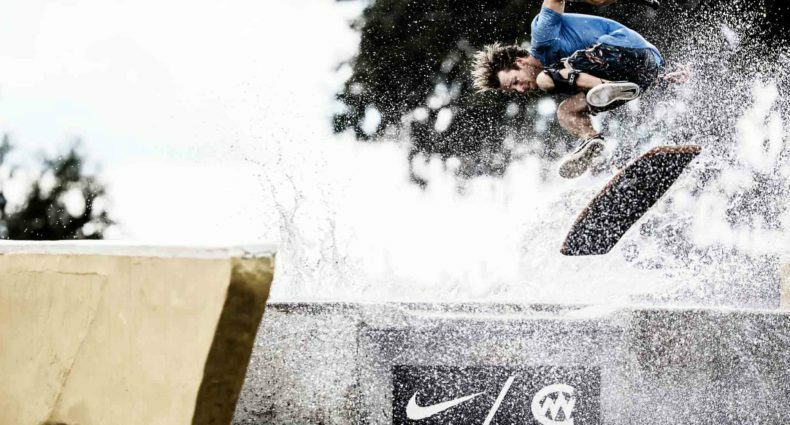 30) What’s the best part about being a pro wakeskater? 31) Where do you stand on the whole “Andy” vs. “Andrew” debate? I don’t really care, but if it’s up to me I’d just go with Andrew. 32) Have you ever met Ryan Sheckler? 32) I heard you’re going to the Dew Tour tomorrow, are you going to meet him? 33) If you had to guess, what would you predict to be the next big fad in wakeskating? 34) Is there anything about wakeskating that you would consider cooler than skateboarding? Just the fact that you’re riding on the water. 35) How has your time been filming for Fun Boots!? Tell us what to expect from your part. Now. How has my time been? Excellent. Couldn’t ask for any better. Fun Boots! should be a really fun video. 36) What can we expect from your part? A lot of winching, and some tricks. 38) Got any plans for the future? Any grand master plan behind all of this madness? 39) What’s a typical day in your life. Wake up, skate, hang out. Me and Boss chill hard, all day long, wakeskate and shred. 40) What’s the most embarrassing thing that’s ever happened to you? I don’t know. I think I peed my pants in like third grade or second grade. I think third. I’m pretty sure my teacher wouldn’t let me go to the bathroom, and ya know, it happens. 43) What’s up with you and the ladies? Am I supposed to give a shout out or something? Refer to question one. 44) Do you purposely stay out of Florida during the summer riding season? Is there any real reason you are trying to leave during the peak season, do you get maxed out by it all or what? Yeah I think the only reason I come back is just the heat. There are a lot of good skate spots, it’s a lot of fun back home. 47) What are some new hobbies you’ve picked up recently? 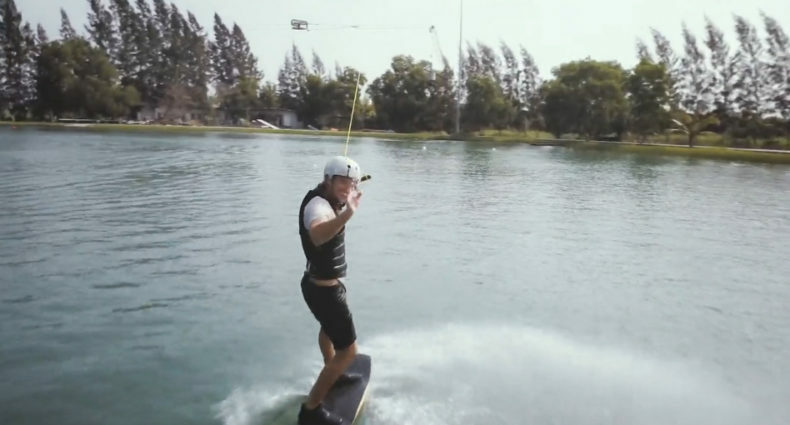 Cross country waterskiing, yo-yoing… I haven’t got to try the Shawkboard yet. I don’t know…roller blading, extreme pranking, what was it the other day that was really extreme… oh, tight rope walking, jumping off stuff, flying… That’s good. 45) Alright, that should be good. How do you want to end this thing up? End it up? How do I want to end it up… TJ give me something. 46) How do you want to die? 48) Who do you wakeskate for Andrew? Myself, New Wakeskates, and The Republic. 49) Anyone you want to thank for anything? I want to thank everyone I have ever met in my entire life.